Every band of villains needs a leader - a leader, someone to scheme and brood and cackle malevolently, is really all that separates a real villainous horde from an everyday band of thugs, or rugby players even. Since no one on Karda Nui ever invented football (and if they did, considering the amount of armour they wear it'd probably just be the pansy American kind anyway), it's just as well they've got people like Icarax around. 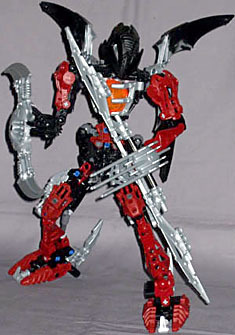 Makuta Icarax is the ultimate winged warrior of shadow! He can batter his foes with his massive shield, drive them down with his rotating shadow sword, or crush them in his clawed hands. Can any power in the universe hope to stop him? 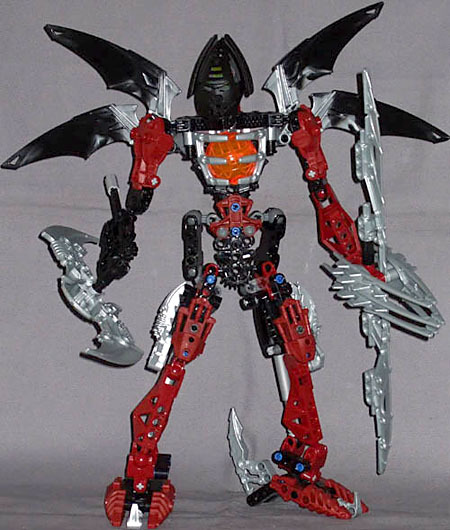 Despite being the only bad guy to have "Makuta" as part of his actual name on the box, Icarax isn't actually the Makuta - that's Teridax (aka "original Makuta"), and Icarax is kind of his Starscream. Since Teridax is MIA during the Phantoka/Mistika conflict (he was actually off taking a kip as part of a rather ambitious Xanatos gambit, but of course nobody knew that), you'd think that'd be Icarax's big chance to assume the leadership - Icarax certainly thought so - but from what I've read I gather no one paid much attention to him, and the Brotherhood of Makuta just humoured his tantrums because he's useful in a fight. Man, even Starscream got to be boss for 15 minutes. Poor Icarax, nobody gives him any respect. Well, the Lego designers did, since he's a full-size Titan-class figure - take that Antroz - and a rather scary-looking one at that. That said, he's not entirely a very ambitious figure, in technical terms. This set is more recent than the Maxilos one we've already reviewed, and evidently in the intervening time Lego noticed that "do splits and fall over" isn't a fan-favourite feature of giant robots, so Icarax has upgraded hips capable of easily supporting his weight, but aside from those, and the obligatory pressure pistons in the legs to keep them upright, he's actually just a beefed up Phantoka. The chest is the obvious re-used part, with the now-familiar Tridax pod in place, but in fact from the waist up he's pretty standard - regular upper and lower arms (one lower arm, anyway), regular head, regular wing assembly, and so on. He's not really new, just tweaked. They're good tweaks, though. The wings double up, adding more size and complexity to them, since the standard Phantoka wing pieces on their own aren't really impressive on regular-sized figures, never mind a Titan. The rearmost of each wing pair can swivel, and with the wing assemblies mounted on balljoints you can get a lot of body language out of positioning them. 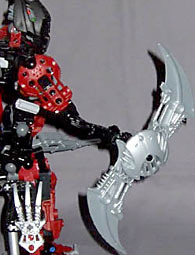 The left hand is a monster of a claw, built with a double-sided spear locked in place, and the mask is a re-use of Teridax's, with the same ability to flip over for your choice of visage: pointy vicious insect face, or sneering haughty arch-villain face (with a bit of a resemblance to Omega from Doctor Who). The legs are more complex - thankfully, since I like a good build - with multi-part feet and heavy thigh frames bulking Icarax out a bit, which helps overcome the effect of the slim upper body. The use of crimson armour over black is very effective, tying him nicely into the Phantoka range, but not overdoing it - with the majority of the upper body, including the wings, monochromatic he looks dark and shadowy. Befitting his arrogant nature he doesn't have a connector piece on his back, so he's in no danger of a Shadow Matoran jumping on him and telling him to giddy-up. His armaments are a bit of a mystery. The "rotating shadow sword" is certainly the thing on his right arm - it actually is his right arm from the elbow down - which has a geared rod running out the back of the elbow connected to the big spinning blades. The mechanism's quite smooth, and can keep itself going well enough for you to let go of the rod to give it another spin, for sustained motion. But if that's the shadow sword, where's the massive shield? It's got a piece in the middle that looks like a shield, but it's hardly massive - but if the whole thing, blades and all, is the shield, that makes the big spear thing the shadow sword, and it can't rotate. (Plus, while we're being picky, he doesn't have "clawed hands" plural, since there's only the one of them.) Still, whatever confusion Icarax's armourer might be suffering from, he looks way lethal with whatever it is he's wielding. Overall, comparing Icarax to Maxilos, he's not really as Titanic - he's more of a hybrid design, part Phantoka Makuta, part Titan. But though you lose some of the impressive engineering, you gain far more functionality - as a toy, and a display piece, Icarax is pretty much flawless, and since his simplified body still has the height of a Titan (with the wings in a standard position he's a foot tall), he looms impressively over the other Makuta, and - on display, at least - fulfils the role of a leader.